Equine vets are truly fantastic. They are like walking encyclopedias, are fairly cheerful when called out at 3am and aren’t averse to being covered in mud/ blood/ poo and worse. Did you know that they are some ways that you could really help your vet out, making their life easier. I work with some exceptional vets to provide training to horse owners on our courses, and a question that I ask them often is what do you wish owners would do. 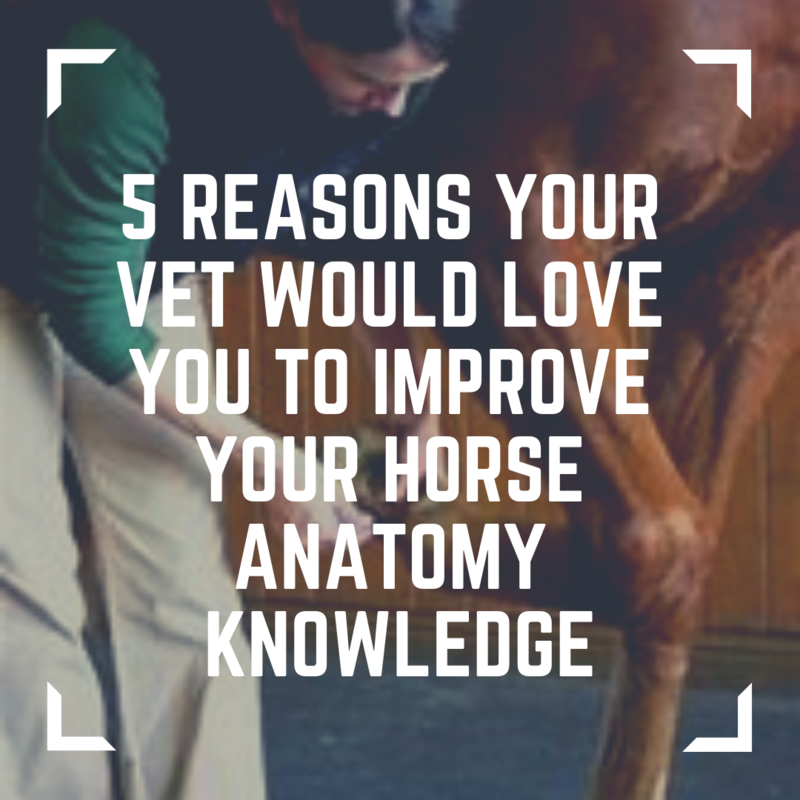 Their answers are always the same; have the horse ready, actually hold the horse (even if that means putting your smartphone down) and know your anatomy. A small cut in the wrong place can have disastrous consequences, and you should always call your vet if your horse has a cut on a joint or over a tendon or tendon sheath. Knowing where these tendons are, and where joints start and finish can really help your decision making in terms of whether a cut requires a vet or not. A small cut might not seem particularly serious, but sometimes a cut can be deeper than it looks, and what seems like a small scratch can actually penetrate a joint. If a joint capsule is compromised it requires flushing out and very special veterinary care to prevent it becoming infected. Sadly an infected joint can be life threatening, so much better to have got the vet earlier on. Vets are brilliant because we can call for advice, but often horse owners aren’t as clear as we could be about the problem at hand. Take the example one of our vets shared recently at one of our Horse Anatomy courses. An owner calling in a terrible panic one Sunday because their horse had a hot fetlock, which then was re-described as a hot stifle. Unsure exactly what they would find the vet jumped in the car and headed over. It turned out to be a hot spot somewhere on the horse’s neck! Worth noticing this as an owner, but probably not requiring a weekend call out. Had this owner, who was no doubt doing their best, had a better understanding of these terms the vet would have been in a much better decision position to have advised the owner over the phone. Most horse owners know that forelimb lameness is associated with a head nod, but not that many owners can reliably pick which leg the horse is lame on. Actually the best way to remember this is that the horse’s head ‘sinks on sound’, so their head drops as the lame leg hits the ground, and ‘lift on lame’ with their head rising up as the lame leg makes contact with the ground. Vets spend five years at veterinary school, making them pretty good at lameness work-ups. Quite often owners debate with the vet as to which leg their horse is actually lame on, and having a basic understanding of functional anatomy would help owners to spot lameness much more easily and correctly. If you know the structure of your horse’s hoof and lower leg it certainly makes conditions such as laminitis easier to compute. This in turn means that you can help your vet much more with noting earlier signs for laminitis, and working together to create more of a treatment plan. On our Horse Anatomy Course we ask our attendees to hold up their arm and point to their ‘fetlock’. The vast majority of people assume this to be their wrist, which I can see has a degree of logic as the wrist is a hinge joint with the hand and the hand appears to be the equivalent of the horse’s hoof. Actually the correct answer is that the human version of the fetlock is your knuckle joint, meaning that the horse is effectively balancing all that weight on a finger tip. Looking more closely at the structure of the hoof the laminae are such a fascinating design. They connect the outside of the hoof wall to the inside, which spreads the force being applied through the joint and also prevents the coffin bone from sinking through the horse’s sole. The laminae connect together like velcro, with a tight interlocking design. One of the problems with laminitis is that the laminae start to separate, causing what must be unbelievable levels of pain for the affected horse or pony. When our vets perform a dissection on our dissection day it is virtually impossible to peel the laminae apart, which shows how painful it must be for the horse or pony with laminitis. Often the laminitic animal is very stoic and all that is seen by the owner is a few ‘pottery steps’, and quite often a shuffling gait in a pony is accepted as normal. Having a greater knowledge of how the hoof is structured really puts laminitis into context and can certainly help you manage this condition together with your vet. Quite often owners are literally killing their horses with kindness, and equine obesity is a growing welfare concern. It’s quite fair that most owners can’t identify when a horse is a healthy condition score. A horse that is overweight, scoring a 6 or 7 is often perceived as looking ‘well’. A horse where you can feel it’s ribs quite easily is generally described by owners as underweight, or ‘needs a good feed’, although this would actually be a healthier animal. Being familiar with numerous bony landmarks such as the ribs, withers, shoulder and hips will help you assess the condition score of your horse much more accurately. Regularly scoring your horse, together with the use of a weighbridge or weightape will help you keep your horse much healthier. It is very hard to spot gradual weight gain when you see your own horse everyday and body condition scoring is a much more objective way of doing this. Want to get the latest updates from NKC Equestrain Training?